Just recently I was touring wine estates in Spain’s Comunidad Valenciana or Valencian Community. This is one of Spain’s autonomous regions and includes the cities of Valencia itself, Alicante and Castellón / Castelló de la Plana. From a wine point of view it is a very exciting part of Spain that includes DO Valencia, DO Alicante and DO Utiel-Requena. It was a wonderful trip, full of wonderful discoveries, great food, delicious wines and memorable characters and I have been very remiss not to tell you all about it before this. Anyway, what set me off on this is that the other day I retried a wine that I had first experienced on that trip and it excited me all over again. In fact it excited me so much that I am making it my Wine of the Week. I really do think that this wine proves my often repeated claim that Spain is the most exciting wine producing country around today. I have long admired the wines of Enrique Mendoza and have actually sold them in the past – their Moscatel de la Marina in my view remains the best of its type, far finer than Muscat de Beaumes de Venise for instance. They are in Alicante, not far in distance from the beaches of Benidorm, but a world away in every other regard. They grow their Muscatel near the coast and the black grapes further inland and much higher up. 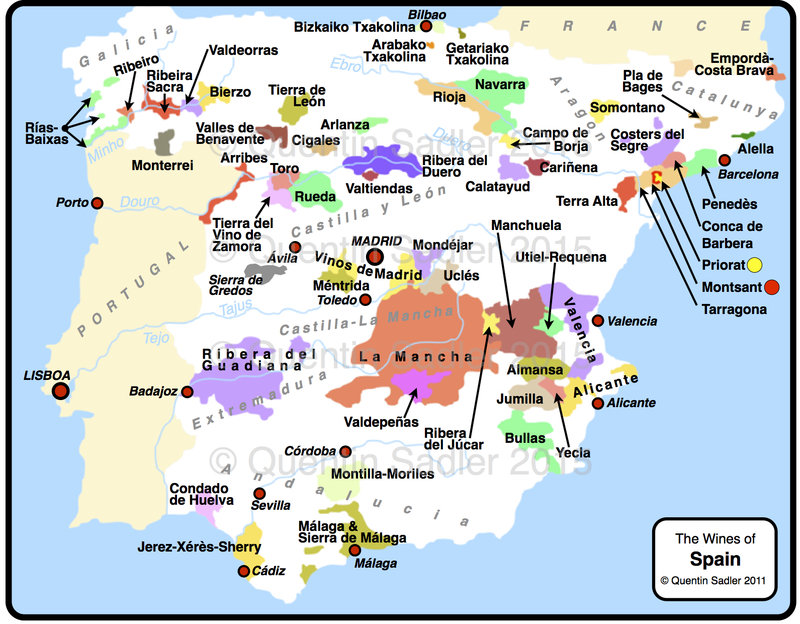 This region is traditionally a place where red wine is made – and the local grape is Monastrell, whereas in Utiel-Requena and Valencia itself they use Bobal. I should point out though that modern knowhow is starting to mean that the whites look pretty good too, particularly from the little known Merseguera grape. The Bodega was founded in 1989, but now Enrique’s son José, known as Pepe, runs the property and he is a larger than life, very funny man who loves his vineyards and really understands them. Pepe trained at Raimat and then unusually gained experience outside Spain first, by making wine at Grove Mill in New Zealand, as well as in Argentina. He grows other grapes, but the focus here is Monastrell, which is known as Mourvèdre in France and often Mataro in other places. The range has changed out of all recognition since I used to sell them. In those days the wines were more international in character – I sold their delicious Cabernet, Merlot and Pinot Noir blend – while now the wines seem to be much more clearly about the place they are from. 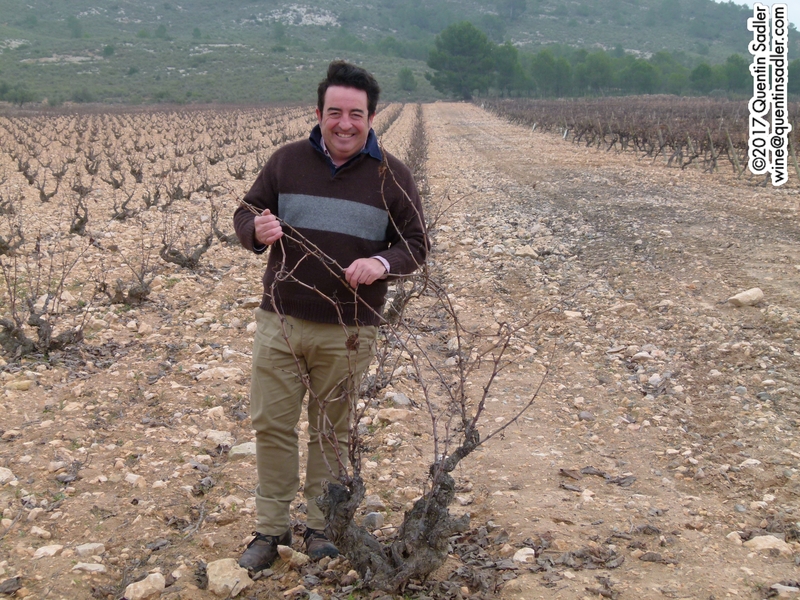 Pepe Mendoza with his beloved ‘bonsai’ vines. 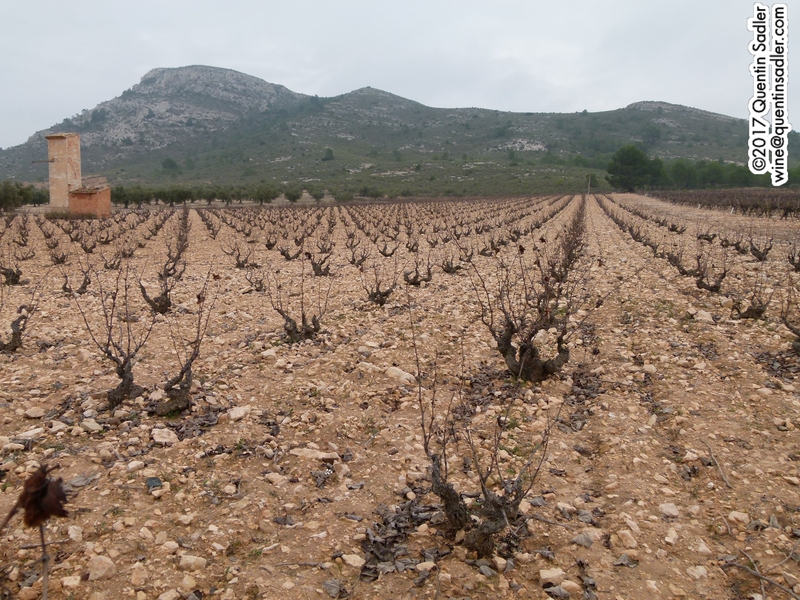 Monastrell is not an easy grapes grow. It needs a lot of heat and also a fair amount of water. Added to which it is susceptible to all sorts of mildews, is very vigorous and can easily get overripe. Add all that together and it is not surprising that it had to wait until modern times and squeaky clean wineries and skilled grape growers for it to become a grape with a following that was not just local. Mendoza has a winery and showroom in l’Alfàs del Pi,very near Benidorm, but most of their vineyards are around 40 km – as the crow flies, much further to drive as this is mountainous country – inland at Villena. This place is between 370 metres and 650 metres above sea level, so gets cooling breezes in the summer – Pepe claimed that they need to wear seaters even in August in the evening – it was certainly very cold in December when I was there. This place with its winds, extreme heat in summer, cold in winters, low vigour, stony soils and only enough water makes the vines struggle and suffer and so they produce small crops of very flavourful grapes. The vines themselves remain small and hug the ground, making them Pepe’s ‘bonsai’ vines. The contrast with Marlborough in New Zealand, where the vines grow like trees, could not be more marked. Pepe farms around 200 acres and makes several different wines from pure Monastrell, or as he puts it, ‘paints plenty of pictures from the same grape’. 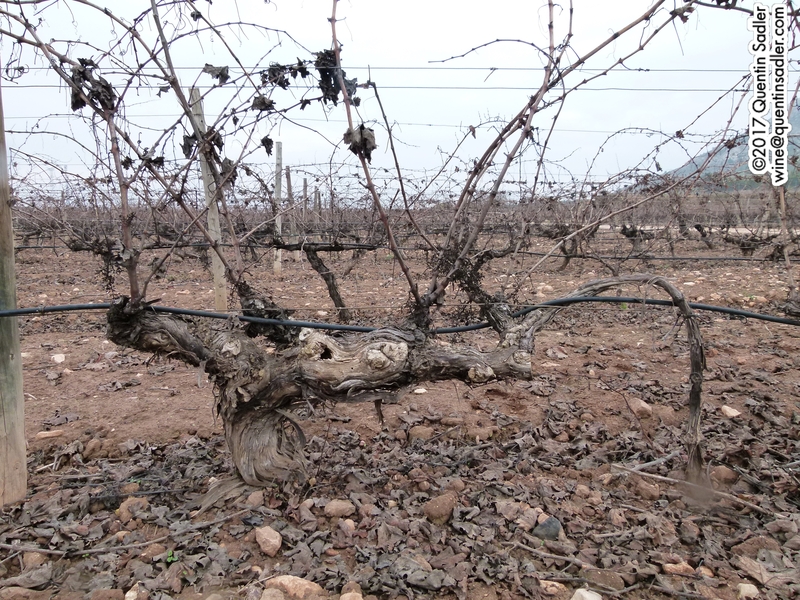 An old Monastrell vine at Enrique Mendoza. This wine is his starting point, or calling card wine. It’s a single vineyard red from the La Tremenda vineyard, which is at around 600 metres above sea level and comprises well drained sand and limestone soils. The grapes are grown organically and biodynamically and are fermented using indigenous yeasts. The wine is then aged for 6months in used American oak barriques – 225 litre – this is intended to soften the wine , but not to flavour it too much. It has an enticing medium purple colour, almost plummy. The nose offers fresh red cherry and plum together with a smattering of black plum, sweet spice, Mediterranean herbs and a little cocoa from the oak. The palate delivers lovely freshness with herbs, dried grass, succulent red cherry and plum, cooked cherry and smooth, silky tannins. A succulent, fleshy and juicy wine with that wonderful freshness making it feel very elegant. Very drinkable and quite lovely, this is a very bright wine, which shows that Pepe has successfully tamed the wild Monastrell grape, but underneath all the succulence and elegance there lurks a deeper, wild, dangerous note. A terrific wine that carries its 14.5% alcohol very well and shows the elegant side of Monastrell at a great price – 92/100 points. Available in the UK for around £10 a bottle from: Simply Wines Direct, Ultracomida, Christopher Piper Wines, Christopher Keiller and Ministry of Drinks. More information is available from the UK importer, C & D Food & Wines. This is a very versatile wine, with enough freshness to partner pretty much everything and to be enjoyable without food. However, it really comes into its own with casseroles, jamon and lamb. Pepe also produces two more single block Monastrells, Estrecho and Las Quebradas. These were both planted in the 1940s and so produce wines with amazing concentration. They are great, but sadly not available in the UK, although they are imported into the US by the Winebow Group.